Congratulations to the winners of my last newsletter contest. Teresa Williams and Kira Moericke, you have each won a newly designed C.C. Hunter t-shirt. 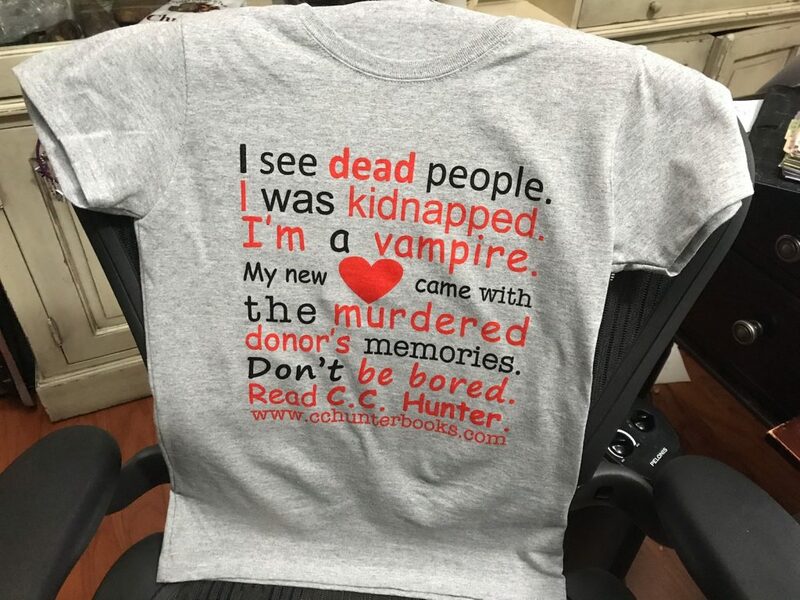 Please email me at cc@cchunterbooks.com with your postal address and t-shirt size. My ‘things’ are books and genealogy. I’d had a love of books and reading since I could hold a book according to my mom. She signed each of us kids up at the library as toddlers, and we were there constantly. It was like a second home for me, devouring book after book. My thing is photography I love taking pictures. I love going to different places, towns because I love the different scenery of each place. I especially like pictures in the evening I think they come out So beautiful and pictures of the moon too. Hi! I have a few things actually. First and foremost is my love of reading and books! My kids call me a bookworm. I love the beautiful covers and the stories they hold.. to hold them, to walk into a bookstore or library , and look round, it feels like home ahh! Another thing of mine is anything ancient world related especially Egypt, Greece, and Rome. Also kind of book related. Lastly, I am an X-ray tech so I love anything bone related LOL!! My things are books, and writing and true crime. For as long as I can remember I have always had my nose in a book, ever since I was a little kid. The first book I picked up was actually Harry Potter and I was 6 years old and I am now 18. And as for writing, I have always journaled, written story stories, poems, etc. and my new found passion is true crime. It is the most interesting thing ever. Trying to figure out why people do the things they do. Reading your post, I related to you about never really fitting in when it came to things/interests or groups. I’m not really an artist, nor a musician, nor an athlete. I’ve never been motivated/attentive at school or achieved many things like my family did when they were my age or younger. 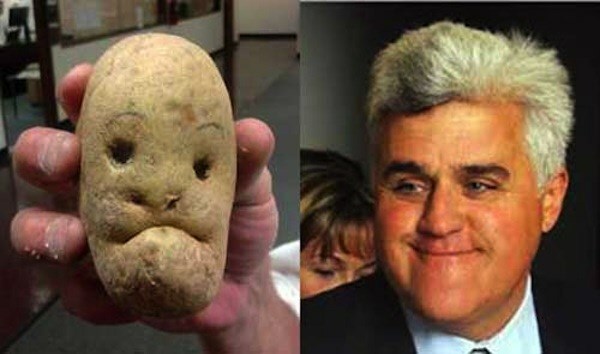 Rereading/realizing (staring at the picture of the potato that looks likes Jay Leno) that my thing could be something not really known as a popular hobby, I immediately knew one activity does bring me excitement. My thing is Card-Making. I’ve never thought that making simple home-made cards could be a thing or a hobby. I find that when a big event comes up, such as a birthday or Father’s Day, that I have the determination to be focused and get a card done. Each time I make a card my skill develops and new ways to design or expand my creativity towards a card are used. Now, I’ve just got to figure out how to make a successful career out of it. My hubby’s a car guy. I love reading, singing along with Youtube and watching movies/tv shows on Netflix and Hulu. Thanks for the great giveaway!! My “thing” would be books and reading. I’ve never really had anything else, in high school I did sports but they were never my passion. If anything I was that one weird friend who liked to read and I was almost embarrased about it. That was 7 years ago, now though I realize that reading books is my passion and I finally got my dream job working at my public library! I have several things, but my top is my art career. I love painting and drawing. Everytime I do a new art show ,get an award ,or get selected for a special exhibition my soul flys. I started drawing when I was just a kid . I didn’t discover my painting passion until I was an adult. I am so glad I had drawing as an outlet as a teenager. I may have went crazy with out it. I tell people that for me drawing is like taking all my thoughts and feelings that get piled inside of me on a daily basis and organizing them in little stacks. It makes me feel more put together but all the worries and feelings are still inside me. Painting thow is opposite. When I pick up a paint brush all my feelings and emotions flow out of me onto the canvas and it releases with such intensity that there are times that I will cry as I’m painting. Most of the time I dont even know what I’m going to paint until It just comes out of my soul. I probably sound like a art nerd right now sorry ,but as common as it may be art is my passion. As a note. Thank you for the giveaway. Love your writing. I worked as a librarian for 10 years .In that time I was over the young adult section and had to read most every book in that section . I have to say yours are among my top favorites. Thanks to me our library ordered most of your books ,but most importantly people really loved them .So think you for all your hard work and for bring joy to peoples lifes. We appreciate it. My thing is for sure books! I’ve always loved reading ever since I was a kid. Unfortunately, I never had friends who enjoyed it as much as I did in high school. If anything I felt it made me weird but now I work a the public library and I’m surrounded by co-workers who love books just as much as I do! In the recent years I’ve come to love watching anime as well and reading manga. Something I never thought I would enjoy to watch and read. I can’t wait to learn more about your new character Andi! I would have to say books are my biggest love. My dream would be to have a house one day with a library. I could fill its shelves with my most favorite books and just be surrounded by all the characters that I have fallen in love with or the worlds I wish I could actually visit! I also love art and designing things with pictures I’ve taken! I even used to use digital art to design book covers for friends I made through Wattpad! I think I have a few things. Reading is probably my number one. I’m definitely a book nerd. But then there’s American Sign Language. Once I started classes for that it was like I knew it was my passion. Now I work with Deaf Blind kiddos and get to use it every day! And lastly my puppies! I’m a big animal lover and I mean big! I love my big Great Dane Zuzu! So books, ASL and Great Danes! Katherine, your job sounds wonderful. Congrats one finding a career you love. And I’m with you on the puppy love. Thanks, Belinda. I hope you’ll give my Mortician’s Daughter series a try. I have a few things/hobbies in my life. I enjoy reading and I often like to make up my own stories in my head just for fun, and sometimes to escape reality. I am also somewhat of a collector. I like to collect items like funko pops, pop culture related clothes/jewelry, rocks, etc. I love singing along to my favorite songs as well as playing some of them on guitar. I am also really into anything Disney or Marvel, and I am pretty sure I’ve seen most if not all of the movies related to these. On a side note, I can also really relate to feeling without a tribe when I was in school. Most people were either athletic or had interests that I didn’t have/participate in. On top of that, I was also very shy/introverted so I wasn’t all that great at making friends or talking to people to find out what they enjoyed. To this day, I am still working on connecting with others, and trying to find people who enjoy the same things that I do. I am forever fortunate to find some really awesome people through social media who like the same things I do, and I don’t feel completely without a tribe. Although, I still wish some days that I could find people in person that like the same things I do as it’s really difficult when your tribe/friends live super far away. Don’t give up looking for that tribe, Nicole. I don’t know how old you are, but it got easier for me as I got older. My thing is either reading or writing. I love to read all genres of books and I write everything from poetry to stories. I’d say my thing is definitely reading, but I also love writing, too, though writing is a bit more difficult because I find myself doubting every word that I write. I think most writers doubt our words. Don’t let that stop you! I would have to say my thing is definitely books! I try to read as much as I can and I’m slowly trying to build my library. I love how books take you to a whole nother world and you don’t even realize you are reading. You are so connected with the characters in the stories. Reading isn’t just a hobby for me, it’s a passion as well. My hobbies are music and reading. I know that’s super cliche, but I’ve been reading since I was 3 and playing music since I was 5, so it’s in my blood. I just finished my master’s degree in music performance and am a librarian, proof that some hobbies are meant to be the core of your life! Thanks for the chance to win! My biggest passion or favorite thing has to be reading. I’ve always loved holding a book in my hand any chance I got. ( now I can just read where ever I go on my phone) thank you technology!!! However, recently I was lucky enough to have gotten custody of my amazing nieces on top of my own two crazy babies. So, I have now fallen in love with cooking and most of all baking for these four extremely hungry little faces. Which my daughter has now fallen in love with as well (baking). What could be better than making incredible desserts with your mini me? !